Although it should have done it a long time ago, Disney has announced it is giving up on fast-food ads on TV, radio stations and websites. According to Walt Disney Co. there will be no more ads promoting candy, fast food and sugar cereal on TV during the morning cartoons. Robert A. Iger, Disney Chairman and CEO said: “We’ve taken steps across our company to support better choices for families. And now, we’re taking the next important step forward by setting new food advertising standards for kids”. Disney’s decision to limit fast-food ads on TV during the hours kids are watching their shows is a step forward. However it is the sort of decision this particular company should have taken a long time ago. For years now, Disney has been promoting junk food on programs for children without scrutiny, becoming part of the problem, rather than the solution. While the new policy might help, it will take a long time to fix the damage already done. Plus as much as everybody is praising the company for taking this important step forward you have to read the details of the statement to find out the policy takes effect as of 2015. But everybody is looking at Disney as a “game changer” and a company that can take a stand against the junk food industry. Moreover, experts hope that Disney’s new rules will inspire similar companies, such as Cartoon Network and Nickelodon. However, Obama himself praised Disney. “Just a few years ago”, said Obama, “if you had told me or any other mom or dad in America that our kids wouldn’t see a single ad for junk food while they watched their favorite cartoons on a major TV network, we wouldn’t have believed you”. Basically what Disney decided to do is come up with a new set of standards when it comes to advertising food and beverages for children. The company introduced similar standards since 2006, which were meant to switch 85 percent of the food and drinks in its theme parks healthy. 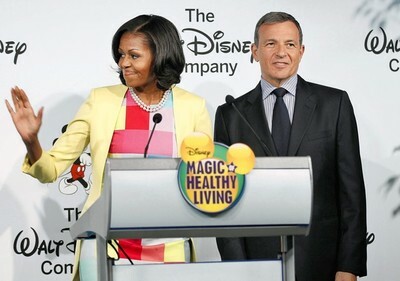 Based on the new standards, Disney will “reduce the amount of sodium by 25 percent in the 12 million children’s meals served annually” and will make “fun public service announcements promoting child exercise and healthy eating”.